At Burma Boating, we organise sailing holidays in Burma (Myanmar). You can go for 5 days or 5 weeks. And you can chill on empty beaches, drink at hand, or go race the dolphins. It’s your choice and it’s easy with Burma Boating. We are a group of passionate sailors who were spellbound when we first sailed into Myanmar’s waters. We discovered pristine islands, beautiful waters, and welcoming people. Right there and then, we decided to share these wonders. 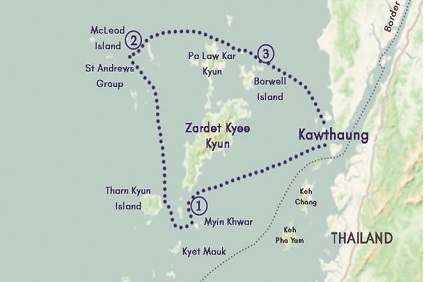 5 Night Cruise sailing from Kawthaung roundtrip aboard a Burma Boating Yacht. 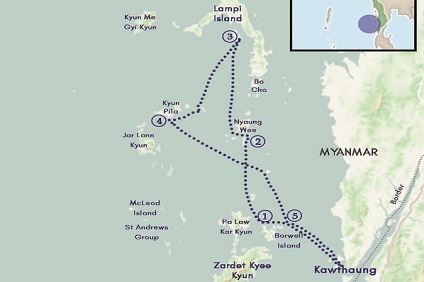 3 Night Cruise sailing from Kawthaung roundtrip aboard a Burma Boating Yacht.